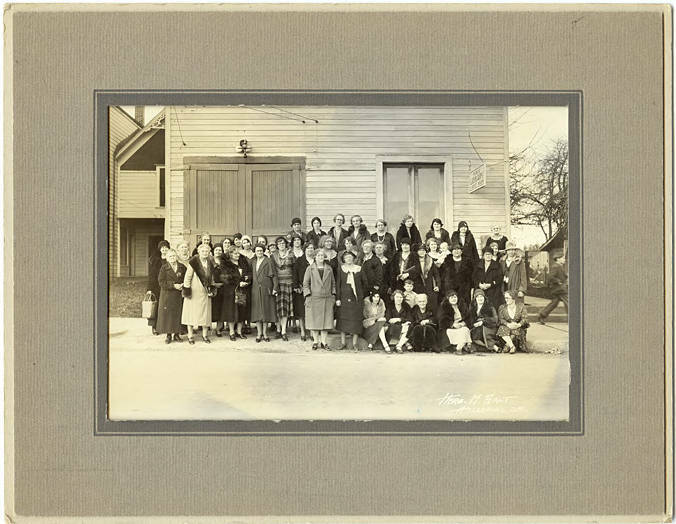 Black and white image of a group of women gathered in front of a wooden building. The sign hanging above them indicates the building is the Public Library and it has a rest room in side. Some of the women wear fur coats; most wear somewhat shapeless dresses of the style in the 1930s. Cloche hats and round, dark framed glasses further set the photo in the late 1930s. [front] [white ink] Herb. M. Salt, Hillsboro, Ore.